Many of us hope to live greener lives to help the environment. Opting for environmentally friendly products helps us cut down on pollution and make the most of the resources that we have. If you are the type to recycle your glass, paper, and plastics, you have more than likely purchased renewable energy products in the past. Popular renewable gadgets include solar lights or garden features. The downside of many green items is that they force you to buy a new version of a product that you might already have. Many of us own a vacuum cleaner, so a solar-powered one is not the most appealing item that comes to mind. One thing we can all use with products that we already own are renewable-energy chargers for our gadgets. We may not invest in a solar-powered computer or phone, even if they were available, but we can all power up our favorite devices with a little less impact on Mother Earth. Cycling enthusiasts can have a new reason to feel good about their contribution to cleaner, greener transportation. Thanks to the SpinPOWER I4, you can now charge your iPhone 4 on your commute to work–without plugging in a single device. This handy charger translates your own energy into electricity to power your phone. If you do not have an Iphone 4, do not fear. 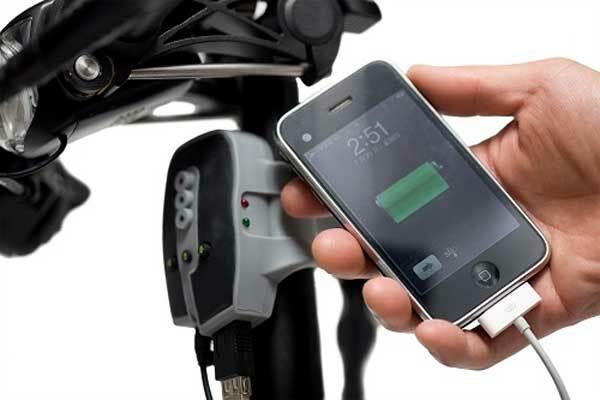 This device will charge other USB-powered gadgets, such as mp3 players, iPods, cameras, and lights for your bike. If you are like most of your fellow humans, you go through life with your cell phone seemingly surgically attached to your body. Smartphones have made us even more dependent on these devices, since our phones now offer more than a way to call our friends–they are vital links to social media, digital music, and our entire lives via cloud storage. So, how can you power up your phone when you don’t have access to an electric outlet. Solar-powered phone chargers come to the rescue in a virtual host of makes and models. The popularity of these green gadget chargers means that there are different versions to choose from, many come with multiple types of adapters for different phones and devices, and you can even make your own if you are handy. These chargers often work with eReaders and tablets as well as phones. If you want to charge your phone in an eco-friendly way, but you happen to live in London or Seattle, do not feel left out. There are renewable energy chargers that do not require ample sunlight. One of these convenient little products is the aptly named K-TOR Pocket Socket. This device is small enough to fit in the palm of your hand yet powerful enough to charge your phone. How? It uses an internal dynamo that is powered by a hand-crank. This gadget is the perfect solution for those who enjoy camping or backpacking. You can live free from the electric socket and not have to worry about occasional cloud cover. Do You Know the Benefits of Internet Reputation Management?